Kepa Arrizabalaga is a Spanish footballer, born on 3rd October 1994 in Ondarroa, Spain. Kepa is a goalkeeper by trade and plays for the English club, Chelsea. Born in the Basque Country, Kepa joined the youth ranks of Athletic Bilbao like may other football aspiring youths of the region. After graduating from the youth academy, he joined CD Basconia, the feeder club of Athletic Bilbao in 2012. Kepa was one of the stars of the Spanish squad who won the 2012 UEFA European U19 Championship. In the semi-final against France, he stopped a couple of penalty shots by Samuel Umtiti and Geoffrey Kondogbia which helped them through to the final. In May 2013, he was named as an unused substitute in a La Liga game against Getafe. Kepa was promoted to the B-team of Athletic Bilbao in 2013 and kept a clean sheet on his debut against UD Logrones. He appeared regularly for the B side amidst a spell of injuries which saw him suffer from pubalgia and then breaking the first metatarsus of his right hand. He moved to smaller clubs like Ponferradina and Real Valladolid on loan deals in search of more playing time. After returning to Bilbao in 2016, he was the third choice behind Gorka Iraizoz and Iago Herrerin. Kepa was called up to the Spanish national squad for the first time on 22nd March 2017 ahead of their 2018 FIFA World Cup Qualifier against Israel. He had to contend with a place in the bench. 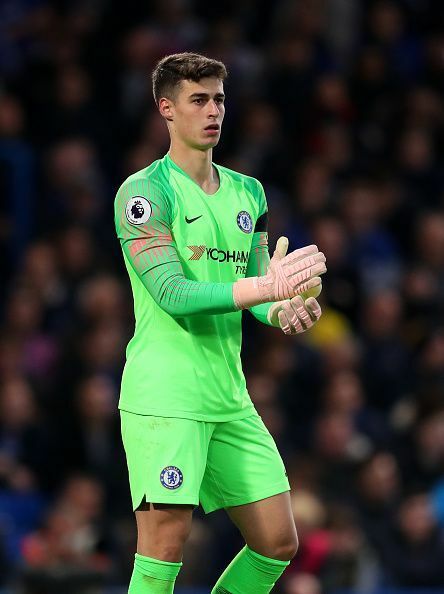 After a number of such appearances on the bench, Kepa made his debut in a 5-0 international friendly win over Costa Rica on 11th November 2017. Kepa made his first-team debut for Athletic Bilbao on 12th September 2016 in a 1-0 win over Deportivo la Coruna. He has been the undisputed number 1 goalkeeper of the side since then. He kept nine clean sheets in the La Liga as Athletic Club finished 7th in the league. Kepa started the 2017-18 season with an inspired form as he kept important clean sheets against Dinamo Bucharest and Panathinaikos to help his team qualify for the UEFA Europa League group stage. He produced his best performance of the season till date against Real Madrid at home where he kept a clean sheet in a 0-0 draw. Since his debut for Bilbao, Kepa has produced impressive statistics. He completes 11.2 long balls per game which is higher than that of Real shot stopper Keylor Navas and Spanish national team keeper David de Gea. He also has a pass completion rate of 61%. Inspite of having impressed for Athletic for the last year and a half, Kepa has only a single cap for his national side. Although he represents the future of Spanish football, his chances are quite limited on an immediate basis since he has to compete with the likes of David de Gea, Pepe Reina, Sergio Rico, Kiko Casilla and Sergio Asenjo. After graduating from the Athletic Bilbao youth set up, Kepa joined CD Basconia in 2012. He made 50 appearances for the Athletic Bilbao II team in the Segunda B Division. In search of more quality football, Kepa joined Ponferradina on loan for the 2014-15 season. After appearing 20 times for Ponferradina, he moved to Real Valladolid on loan and represented them 40 times in the 2015-16 season. He returned to Athletic at the beginning of the 2016-17 season and has played in 45 matches for them since then. Kepa signed a new contract for Athletic Bilbao in January 2018 amidst interest from Real Madrid. His new deal lasts till June 2025 and also has a €80 million release clause. Premier League: Fulham 1-2 Chelsea | Match Reaction to three important points for Maurizio Sarri and Chelsea!